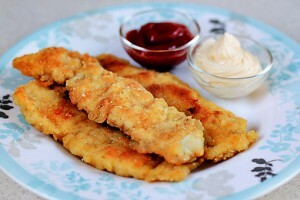 Crispy Chicken Fingers recipe by Zeba at DesiRecipes.com. 1. Cut the chicken fillets into strips about 12 inch wide and 2 inch long. Marinate the chicken strips with lemon juice, 1/2 teaspoon salt and 1/2 teaspoon pepper and keep aside for about an hour, Drain excess water and pat dry the strips. 2. Combine in a medium bowl, flour, chilli powder and remaining salt and pepper. Add chicken strips and mix well to coat the chicken with flour. 3. Dip the chicken strips first in egg, then coat with breadcrumb and place them on a tray in single layer. 4. Heat the oil in a large karahi or deep frying pan. Carefully immerse 6-8 chicken strips into the hot oil at a time for 35 minutes, turning them over once or twice. Fry to a golden crisp colour. 5. Drain on paper towels. Serve with ketchup and garlic chutney.